This article is about co-ordinate geometry. For the study of analytic varieties, see Algebraic geometry § Analytic geometry. In classical mathematics, analytic geometry, also known as coordinate geometry or Cartesian geometry, is the study of geometry using a coordinate system. This contrasts with synthetic geometry. Analytic geometry is widely used in physics and engineering, and also in aviation, rocketry, space science, and spaceflight. It is the foundation of most modern fields of geometry, including algebraic, differential, discrete and computational geometry. Usually the Cartesian coordinate system is applied to manipulate equations for planes, straight lines, and squares, often in two and sometimes in three dimensions. Geometrically, one studies the Euclidean plane (two dimensions) and Euclidean space (three dimensions). As taught in school books, analytic geometry can be explained more simply: it is concerned with defining and representing geometrical shapes in a numerical way and extracting numerical information from shapes' numerical definitions and representations. That the algebra of the real numbers can be employed to yield results about the linear continuum of geometry relies on the Cantor–Dedekind axiom. The Greek mathematician Menaechmus solved problems and proved theorems by using a method that had a strong resemblance to the use of coordinates and it has sometimes been maintained that he had introduced analytic geometry. Apollonius of Perga, in On Determinate Section, dealt with problems in a manner that may be called an analytic geometry of one dimension; with the question of finding points on a line that were in a ratio to the others. Apollonius in the Conics further developed a method that is so similar to analytic geometry that his work is sometimes thought to have anticipated the work of Descartes by some 1800 years. His application of reference lines, a diameter and a tangent is essentially no different from our modern use of a coordinate frame, where the distances measured along the diameter from the point of tangency are the abscissas, and the segments parallel to the tangent and intercepted between the axis and the curve are the ordinates. He further developed relations between the abscissas and the corresponding ordinates that are equivalent to rhetorical equations of curves. However, although Apollonius came close to developing analytic geometry, he did not manage to do so since he did not take into account negative magnitudes and in every case the coordinate system was superimposed upon a given curve a posteriori instead of a priori. That is, equations were determined by curves, but curves were not determined by equations. Coordinates, variables, and equations were subsidiary notions applied to a specific geometric situation. Analytic geometry was independently invented by René Descartes and Pierre de Fermat, although Descartes is sometimes given sole credit. Cartesian geometry, the alternative term used for analytic geometry, is named after Descartes. Descartes made significant progress with the methods in an essay titled La Geometrie (Geometry), one of the three accompanying essays (appendices) published in 1637 together with his Discourse on the Method for Rightly Directing One's Reason and Searching for Truth in the Sciences, commonly referred to as Discourse on Method. This work, written in his native French tongue, and its philosophical principles, provided a foundation for calculus in Europe. Initially the work was not well received, due, in part, to the many gaps in arguments and complicated equations. Only after the translation into Latin and the addition of commentary by van Schooten in 1649 (and further work thereafter) did Descartes's masterpiece receive due recognition. Pierre de Fermat also pioneered the development of analytic geometry. Although not published in his lifetime, a manuscript form of Ad locos planos et solidos isagoge (Introduction to Plane and Solid Loci) was circulating in Paris in 1637, just prior to the publication of Descartes' Discourse. Clearly written and well received, the Introduction also laid the groundwork for analytical geometry. The key difference between Fermat's and Descartes' treatments is a matter of viewpoint: Fermat always started with an algebraic equation and then described the geometric curve which satisfied it, whereas Descartes started with geometric curves and produced their equations as one of several properties of the curves. As a consequence of this approach, Descartes had to deal with more complicated equations and he had to develop the methods to work with polynomial equations of higher degree. It was Leonhard Euler who first applied the coordinate method in a systematic study of space curves and surfaces. Illustration of a Cartesian coordinate plane. 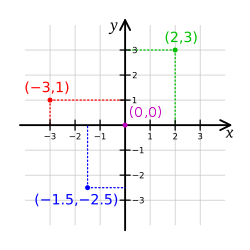 Four points are marked and labeled with their coordinates: (2,3) in green, (−3,1) in red, (−1.5,−2.5) in blue, and the origin (0,0) in purple. The most common coordinate system to use is the Cartesian coordinate system, where each point has an x-coordinate representing its horizontal position, and a y-coordinate representing its vertical position. These are typically written as an ordered pair (x, y). This system can also be used for three-dimensional geometry, where every point in Euclidean space is represented by an ordered triple of coordinates (x, y, z). In polar coordinates, every point of the plane is represented by its distance r from the origin and its angle θ from the polar axis. In cylindrical coordinates, every point of space is represented by its height z, its radius r from the z-axis and the angle θ its projection on the xy-plane makes with respect to the horizontal axis. In spherical coordinates, every point in space is represented by its distance ρ from the origin, the angle θ its projection on the xy-plane makes with respect to the horizontal axis, and the angle φ that it makes with respect to the z-axis. The names of the angles are often reversed in physics. In analytic geometry, any equation involving the coordinates specifies a subset of the plane, namely the solution set for the equation, or locus. For example, the equation y = x corresponds to the set of all the points on the plane whose x-coordinate and y-coordinate are equal. These points form a line, and y = x is said to be the equation for this line. In general, linear equations involving x and y specify lines, quadratic equations specify conic sections, and more complicated equations describe more complicated figures. Usually, a single equation corresponds to a curve on the plane. This is not always the case: the trivial equation x = x specifies the entire plane, and the equation x2 + y2 = 0 specifies only the single point (0, 0). In three dimensions, a single equation usually gives a surface, and a curve must be specified as the intersection of two surfaces (see below), or as a system of parametric equations. The equation x2 + y2 = r2 is the equation for any circle centered at the origin (0, 0) with a radius of r.
m is the slope or gradient of the line. b is the y-intercept of the line. x is the independent variable of the function y = f(x). In a manner analogous to the way lines in a two-dimensional space are described using a point-slope form for their equations, planes in a three dimensional space have a natural description using a point in the plane and a vector orthogonal to it (the normal vector) to indicate its "inclination". as a normal. This familiar equation for a plane is called the general form of the equation of the plane. x, y, and z are all functions of the independent variable t which ranges over the real numbers. (x0, y0, z0) is any point on the line. a, b, and c are related to the slope of the line, such that the vector (a, b, c) is parallel to the line. , the equation represents a rectangular hyperbola. Quadric surfaces include ellipsoids (including the sphere), paraboloids, hyperboloids, cylinders, cones, and planes. The distance formula on the plane follows from the Pythagorean theorem. where m is the slope of the line. where θ is the angle between A and B.
Transformations are applied to a parent function to turn it into a new function with similar characteristics. There are other standard transformation not typically studied in elementary analytic geometry because the transformations change the shape of objects in ways not usually considered. Skewing is an example of a transformation not usually considered. For more information, consult the Wikipedia article on affine transformations. values mean the function is translated to the positive end of its axis and negative meaning translation towards the negative end. Transformations can be applied to any geometric equation whether or not the equation represents a function. Transformations can be considered as individual transactions or in combinations. is the relation that describes the unit circle. which are in both relations. so it is not in the intersection. Traditional methods for finding intersections include substitution and elimination. For conic sections, as many as 4 points might be in the intersection. In geometry, the tangent line (or simply tangent) to a plane curve at a given point is the straight line that "just touches" the curve at that point. Informally, it is a line through a pair of infinitely close points on the curve. More precisely, a straight line is said to be a tangent of a curve y = f(x) at a point x = c on the curve if the line passes through the point (c, f(c)) on the curve and has slope f'(c) where f' is the derivative of f. A similar definition applies to space curves and curves in n-dimensional Euclidean space. In geometry, a normal is an object such as a line or vector that is perpendicular to a given object. For example, in the two-dimensional case, the normal line to a curve at a given point is the line perpendicular to the tangent line to the curve at the point. In the three-dimensional case a surface normal, or simply normal, to a surface at a point P is a vector that is perpendicular to the tangent plane to that surface at P. The word "normal" is also used as an adjective: a line normal to a plane, the normal component of a force, the normal vector, etc. The concept of normality generalizes to orthogonality. ^ Boyer, Carl B. (1991). "The Age of Plato and Aristotle". A History of Mathematics (Second ed.). John Wiley & Sons, Inc. pp. 94–95. ISBN 0-471-54397-7. Menaechmus apparently derived these properties of the conic sections and others as well. Since this material has a strong resemblance to the use of coordinates, as illustrated above, it has sometimes been maintained that Menaechmus had analytic geometry. Such a judgment is warranted only in part, for certainly Menaechmus was unaware that any equation in two unknown quantities determines a curve. In fact, the general concept of an equation in unknown quantities was alien to Greek thought. It was shortcomings in algebraic notations that, more than anything else, operated against the Greek achievement of a full-fledged coordinate geometry. ^ Boyer, Carl B. (1991). "Apollonius of Perga". A History of Mathematics (Second ed.). John Wiley & Sons, Inc. p. 142. ISBN 0-471-54397-7. The Apollonian treatise On Determinate Section dealt with what might be called an analytic geometry of one dimension. It considered the following general problem, using the typical Greek algebraic analysis in geometric form: Given four points A, B, C, D on a straight line, determine a fifth point P on it such that the rectangle on AP and CP is in a given ratio to the rectangle on BP and DP. Here, too, the problem reduces easily to the solution of a quadratic; and, as in other cases, Apollonius treated the question exhaustively, including the limits of possibility and the number of solutions. ^ Boyer, Carl B. (1991). "Apollonius of Perga". A History of Mathematics (Second ed.). John Wiley & Sons, Inc. p. 156. ISBN 0-471-54397-7. The method of Apollonius in the Conics in many respects are so similar to the modern approach that his work sometimes is judged to be an analytic geometry anticipating that of Descartes by 1800 years. The application of references lines in general, and of a diameter and a tangent at its extremity in particular, is, of course, not essentially different from the use of a coordinate frame, whether rectangular or, more generally, oblique. Distances measured along the diameter from the point of tangency are the abscissas, and segments parallel to the tangent and intercepted between the axis and the curve are the ordinates. The Apollonian relationship between these abscissas and the corresponding ordinates are nothing more nor less than rhetorical forms of the equations of the curves. However, Greek geometric algebra did not provide for negative magnitudes; moreover, the coordinate system was in every case superimposed a posteriori upon a given curve in order to study its properties. There appear to be no cases in ancient geometry in which a coordinate frame of reference was laid down a priori for purposes of graphical representation of an equation or relationship, whether symbolically or rhetorically expressed. Of Greek geometry we may say that equations are determined by curves, but not that curves are determined by equations. Coordinates, variables, and equations were subsidiary notions derived from a specific geometric situation; [...] That Apollonius, the greatest geometer of antiquity, failed to develop analytic geometry, was probably the result of a poverty of curves rather than of thought. General methods are not necessary when problems concern always one of a limited number of particular cases. ^ a b Boyer (1991). "The Arabic Hegemony". A History of Mathematics. pp. 241–242. Omar Khayyam (ca. 1050–1123), the "tent-maker," wrote an Algebra that went beyond that of al-Khwarizmi to include equations of third degree. Like his Arab predecessors, Omar Khayyam provided for quadratic equations both arithmetic and geometric solutions; for general cubic equations, he believed (mistakenly, as the sixteenth century later showed), arithmetic solutions were impossible; hence he gave only geometric solutions. The scheme of using intersecting conics to solve cubics had been used earlier by Menaechmus, Archimedes, and Alhazan, but Omar Khayyam took the praiseworthy step of generalizing the method to cover all third-degree equations (having positive roots). For equations of higher degree than three, Omar Khayyam evidently did not envision similar geometric methods, for space does not contain more than three dimensions, ... One of the most fruitful contributions of Arabic eclecticism was the tendency to close the gap between numerical and geometric algebra. The decisive step in this direction came much later with Descartes, but Omar Khayyam was moving in this direction when he wrote, "Whoever thinks algebra is a trick in obtaining unknowns has thought it in vain. No attention should be paid to the fact that algebra and geometry are different in appearance. Algebras are geometric facts which are proved." ^ Glen M. Cooper (2003). "Omar Khayyam, the Mathematician", The Journal of the American Oriental Society 123. ^ Cooper, G. (2003). Journal of the American Oriental Society,123(1), 248-249. ^ Stillwell, John (2004). "Analytic Geometry". Mathematics and its History (Second ed.). Springer Science + Business Media Inc. p. 105. ISBN 0-387-95336-1. the two founders of analytic geometry, Fermat and Descartes, were both strongly influenced by these developments. ^ Cooke, Roger (1997). "The Calculus". The History of Mathematics: A Brief Course. Wiley-Interscience. p. 326. ISBN 0-471-18082-3. The person who is popularly credited with being the discoverer of analytic geometry was the philosopher René Descartes (1596–1650), one of the most influential thinkers of the modern era. ^ Pierre de Fermat, Varia Opera Mathematica d. Petri de Fermat, Senatoris Tolosani (Toulouse, France: Jean Pech, 1679), "Ad locos planos et solidos isagoge," pp. 91–103. ^ M.R. Spiegel; S. Lipschutz; D. Spellman (2009). Vector Analysis (Schaum’s Outlines) (2nd ed.). McGraw Hill. ISBN 978-0-07-161545-7. ^ While this discussion is limited to the xy-plane, it can easily be extended to higher dimensions. John Casey (1885) Analytic Geometry of the Point, Line, Circle, and Conic Sections, link from Internet Archive.